In the current March Issue of Dazed & Confused, visual arts editor Francesca Gavin aimed to explore the return of abstract painting in contemporary art. Alongside the full print feature published yesterday on Dazed Digital, this week we'll be posting daily updated features on her nine new abstract artists to watch out for - kicking off with Alex Hubbard, Tauba Auerbach and Niall McClelland today. 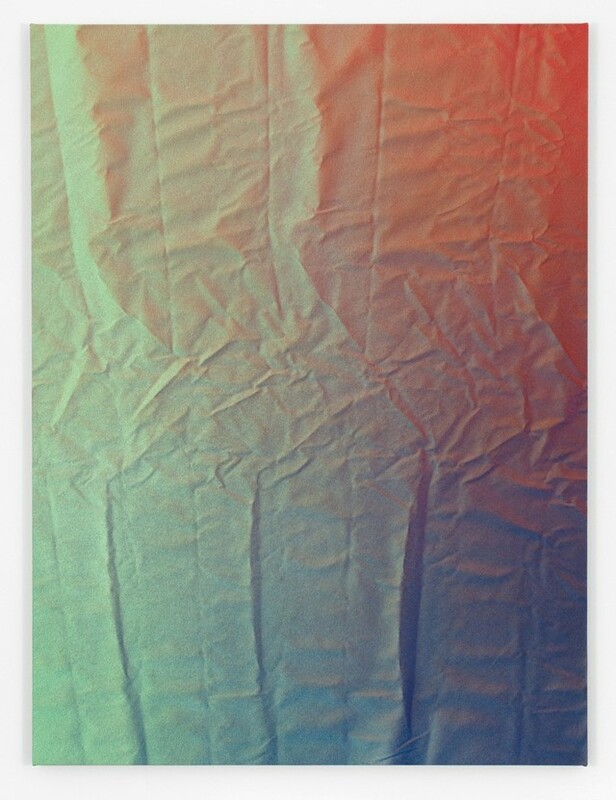 With a major show opening at the Brussels gallery Wiels this month, San Francisco and New York-based artist Tauba Auerbach's Folds series of canvases were folded and sprayed with an industrial wash of colour to create works that are flat and 3D when stretched. Tauba Auerbach: Tetrachromat; 22 March - 2nd June 2013 at Wiels, Brussels. Primarily made up of paintings incorporating fibreglass, resin and oil paint, Oregon-born, New York-based artist Alex Hubbard’s practice is as much about the process of his work as the final results. Despite it not being his main purpose, it's an aspect that is presented in his video pieces, which follow the artist piling objects, paint, and materials on board or in sculptural forms for the camera. “I had worked with resin and fibreglass in my failed attempts to make my own surfboards, they were shortboards made out of broken longboards. They failed as surfboards but I love the material. I love the texture of fibreglass and the quick nature of resin, it condenses the painting process into almost mechanical gestures.” Hubbard's use of intense colour is partly a reaction of the dominance of black, such as in his Just Like Pants exhibition featuring work made up of a palette taken from Four Loko cans. Taking a fresh approach to the foundations of the history of abstract painting, Toronto artist Niall McClelland focuses on exploring the mistakes that emerge from the misuse of everyday materials such as lightbulbs, photocopies and toner cartridges. Playing with repetition, McClelland creates works on paper and canvas, presented in similar ways to paintings on walls. “It’s not a mechanical repetition but a human attempt at repeating, so all the errors are apparent. These ideas of error and chance seem to lie at the heart of the abstract question. “Whether it’s a naïve line or a bold, confident line, complicated or simple, I think there’s something else that comes out of that, like an attitude or a point of view, or a stamp.” he says. Check back tomorrow for Katy Moran, Keltie Ferris and David Ostrowski.